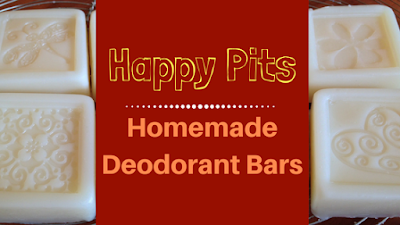 Bat Lady Herbals: Happy Pits! One of the worst things about living is Florida is that it's hot. Not just in the summer, but all year round, it's hot. Since moving to Central Florida 11 years ago, I have used my winter coat maybe 10 times. Last year I didn't even have to put it on once. This consistently high temperature is great for growing plants, but not so good for for the whole BO (body odor) situation. While having a good diet and being in moderately good health can go a long way to eliminating the stink of BO, sometimes you need a little extra boost. Enter, deodorant. Deodorant is part of my morning (and sometimes afternoon) routine. I wake up, brush my teeth, do a little dry brushing, take a shower, and apply my deodorant before I really get my day started. But I cannot justify using typical deodorants. There are so many ingredients, even in some of the “natural” deodorants, that are linked to health problems. Aluminum has been linked to Alzheimer's and breast cancer. Parabens have also been linked to cancer, as well as several hormone conditions. And there are many more of these nasty ingredients in most store-bought deodorants. This is why I decided to make my own. Making the switch to a homemade deodorant seems like an easy thing to do, but I just want to warn you that there is a detox period. Your body detoxes itself by sweating. Conventional deodorant and antiperspirant clog your pores. When you sweat, your body pushes out those toxins, but if you are using a typical deodorant, you're just putting those toxins right back. This is why pit stains occur. After you make the switch to natural deodorant, your body will push out all those toxins that have been clogging your pores, and after a few days your pits will be detoxed and much happier. Now, there are hundreds of recipes for homemade deodorant online now a days. They range from a liquid spray, to a cream, to powder, and all in between. 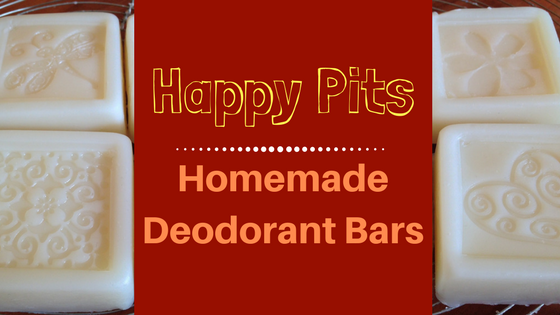 This recipe is for my favorite application, deodorant bars. I tend to work in hot environments, moving around quite a bit. I wanted a deodorant that I could take with me and use when I felt I needed a touch up. So I worked on a few recipes, combining ideas and finally developed my deodorant bar. This recipe mashed together the concept of deodorant and lotion bars. You can use an old deodorant container if you want, but I like to use silicone molds for mine. It stays solid enough that I can leave a small bar in my bag during most of the Florida year (as long as I remember to not leave it in the car). Coconut Oil is super antibiotic, and when you're dealing with your pits, you want as much antibiotic action as possible. You can choose a different oil, but coconut oil is semi-solid at room temperature so if you decide to substitute, make sure you increase your beeswax to match it. Almond Oil is full of amino acids and vitamins that your skin needs to stay healthy. It also helps the more solid oils, such as coconut oil, to penetrate deeply. You can choose a different oil here if you'd like. One of my other favorites is olive oil. Cocoa Butter will help your deodorant to stay more creamy and less oily. It's also super packed full of nutrients that help to keep your skin happy. You can substitute Shea butter if you'd like, but cocoa butter is more dense and will help your deodorant bar stay more solid in those hot months. Arrowroot Powder is a must for deodorants. Not only does it act as a thickener to help your deodorant bar stay solid. It also helps to draw toxins out of your body. Beeswax helps to solidify these deodorant bars, but it also helps to provide a protective layer on your skin, without clogging your pores. Vitamin E can be found in most oils you might use, but it's essential for healthy skin. This is why I like to add extra vitamin E to all of my skin products. Tea Tree Oil may not be 100% necessary for a deodorant recipe, but I like to add it in to all of mine. The #1 reason? Because it is one of the most powerfully antibiotic essential oils I know of. Your pits are breeding grounds for bacteria, and bacteria is the leading cause of body odor. It just makes since to pack extra antibiotic power into your deodorant. Plus, it doesn't irritate most people's skin! If you don't like the scent, don't worry. This recipe only calls for 5 drops, you can overpower it easily by adding more of your favorite essential oils. However, I think it blends very well with lavender essential oil, which is one of my favorites. Essential Oils are all antibiotic to a certain extent. However, the main reason for these is to make you happy. Add whatever essential oils you want, in order to make your deodorant smell pleasant. I personally like to do 5 drops Lavender, 5 drops Cedarwood, and 5 drops Lemongrass. A word of caution however, make sure to test your essential oils on the inside of your wrist first. That way you don't put irritating oils on such a sensitive area. Combine first four ingredients in a glass jar and place in a pot half filled with water. Bring water to a boil and stir ingredients until melted. Remove jar from pan and slowly add arrowroot powder, stirring constantly to prevent the formation of clumps. Allow to rest until you are able to safely handle the jar (don't wait too long or the mixture will be mostly solid and hard to work with). Add remaining ingredients and stir. Pour liquid into molds (or deodorant containers), cover, and allow to cool overnight. You can put them in the refrigerator to speed up the cooling process if you want. Once completely cooled, remove from molds and wrap with wax paper. Store in a cool, dry place. I hope you enjoy these deodorant bars. For more essential oil blend ideas, check out my previous entry, Herbal Home Fresheners for Spring. If you have any questions or comments, please leave them below! Thank you so much for reading and I'm glad you've enjoyed. I hope the deodorant bars work well for you.